21 Jump Street was a remake I did not want to see initially. I was fond of that show since while it had comedic moments it was a crime drama focusing on serious issues. I dreaded what would become of that until I saw it. It was a different beast entirely and thus very easily to separate it from the show. I found myself liking the movie more than I anticipated and even was pleasantly surprised. Naturally with the announcement and the teasing of a sequel (like with this parody clip on Jean Claude Van Damme and his commercial) I was looking forward to it. This was really funny, at least I think so. But then I watched 22 Jump Street. It kept referring to the original in saying how it was the same and yes maybe story wise it was but everything else was way off. More about this later. I expected the jokes to be juvenile and the story to be bland but weren't sequels supposed to be bigger and better. 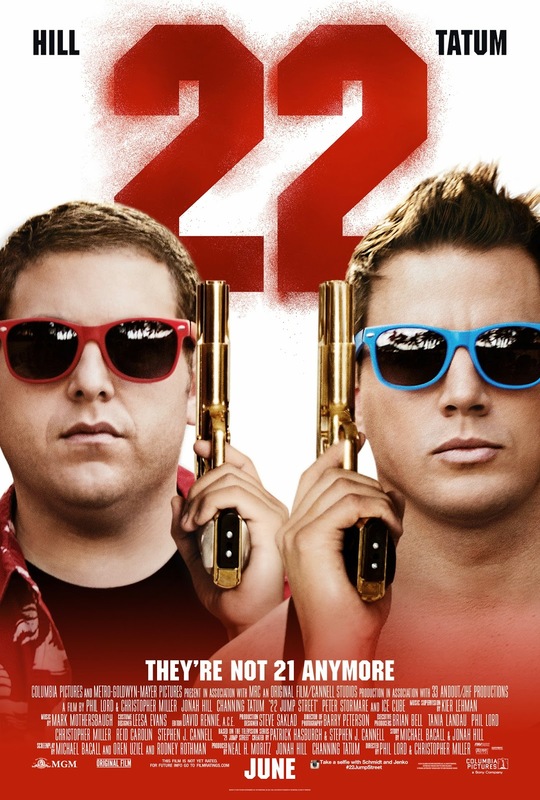 22 Jump Street is like a poor copy of the first part where everything that was making it fun removed. I did laugh a few times, but for the most part I was like: " Ok, will it get better any time soon or what? " A lot of the comedy is forced to a point that a scene goes on and on build around a single joke. And it takes you away from the humour instead of putting you right in the middle of it. The only saving grace is the chemistry between Channing Tatum and Jonah Hill which is decreased considerably because of an unwise plot decision. As I told you earlier they kept referring to the original probably because the writers thought they were very clever and decided to go meta. Which I must admit is funny on occasion. But if it keeps returning in every scene in a way that it takes you out of the plot than I think you have failed. A very good example of meta done right is in a little movie called Waxwork II: Lost in Time . Compared to the first one this sequel is very poorly done. It's not the worst I have seen but I am beginning to think that Hollywood doesn't know how to do good comedy any more. There was a time you could literally watch any comedy without getting let down. Now I am struggling to find one that does what it is set out to do. It wasn't like I had high expectations or anything. You will undoubtedly have read some reviews where most of the time they praise this sequel. I am astonished by this. Some even dared to say it was better than previous one. Don't get fooled by this. In no shape or form is it that good. Actually something really weird is going on here. The reviews favour this below average comedy so much that foul play is involved. Personally I can't recommend this at all. To put it in to context, I can enjoy the cheesiest of movies. This ain't one of them.